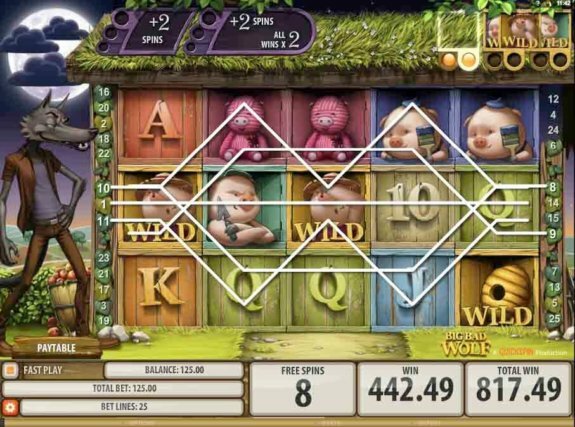 Prepare yourself to be transported to a world-famous fairy tale through Quickspin’s Big Bad Wolf video slot game. The game is based on James Halliwell-Phillipps’s famous tale The Three Little Pigs where three little pigs try building their houses from different materials. In Quickspin’s Big Bad Wolf slot, the villain wolf huffs and puffs BIG WINS, and it’s up to you to wittily swipe them from under his nose. This guide is here to help you accomplish this with much ease! Why Big Bad Wolf? 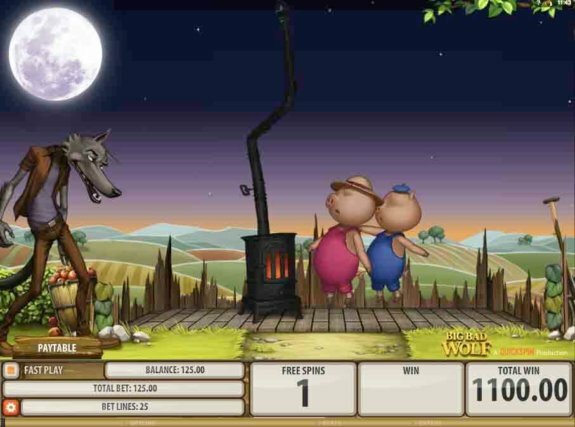 The Three Little Pigs gets reinvented thanks to this Quickspin Slot. A fairytale for young adults loaded with bonus money, free spins and many surprises. Where to play Big Bad Wolf? Who’s afraid of the big bad wolf? Not us! Maybe you? Take up the role of the wolf and be the villain as you blow down the pigs houses in order to win the exciting cash prizes that the game has to offer. The gam’s illustrations are bright and look very fairytale like. The game has been set against the backdrop of an idyllic orchard, located high up in the hills. The skies are clear and blue, and the soft green grass and fresh produce dominate the background. There’s also the wooden hut, where all the three pigs are housed. The visuals and detail in presenting this home are worth applauding. If that doesn’t get your attention, then the straw roof with creepers running down the sides will surely get you right at the center of the game. Our wolf makes an appearance later into the game, and this time, he’s wearing a slick new avatar with well-ironed pants, a turtleneck shirt and a stylish leather jacket. Will he be able to achieve his goal this time and devour the three little pigs? The pigs, just as you’d expect, have retained their cuteness quotient, evident from the crisp graphics used to portray this. In the midst of the pigs and the wolf, a honeycomb makes a surprise appearance, and it comes bearing surprise cash prizes. Big Bad Wolf has 5 reels and 25 paylines. At any given time, all the 25 paylines are always active, making it very easy for you to bet. 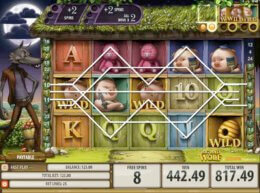 All you need to do is select the much that you’d like to wager using the game’s Bet Per Line meter. Once you are satisfied with your selection, click on the big orange spin button and see the reels start to spin! The game also features a FAST PLAY feature that’s meant to accommodate players who prefer their reels to spin a little bit faster. 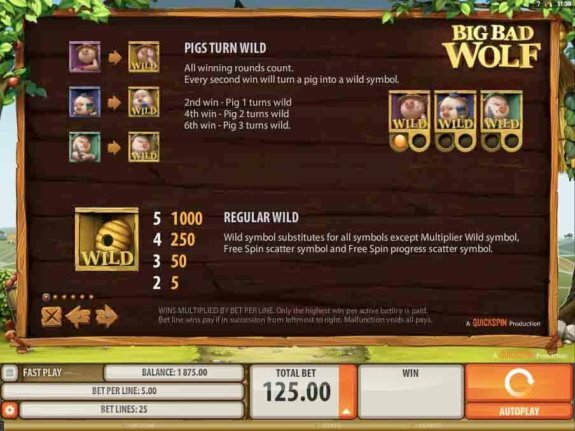 Big Bad Wolf has a highly lucrative Swooping Reels Feature that will remove all symbols used in creating winning combinations. And after all the wins have been accounted for, this feature will fill the spaces with new symbols from above. If there are any new wins, they’ll be added to your payout and the feature will continue until all the wins have been created. 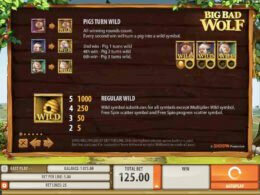 Play Big Bad Wolf for free! Pig Turn Wild Feature: After you land your second successive win from the swooping reels, a pig will become wild. And after six winning spins, three pigs automatically become wild. The slot is a banger! It’s totally cool to look at, and the bonuses are exceptional. Add the Swooping Reels feature and Pig Wilds and Big Bad Wolf is a pleasure to play. Join the meanest Wolf online as he huffs and puffs for wins. And as we mentioned, be quick enough to steal his wins from under his nose! PS: We really enjoyed playing this game but we’ll still rate it at 4/5 because it took long to trigger the bonus game.